Devon MP Geoffrey Cox has hit out after Appledore shipyard lost a £30m contract for a survey vessel. The order has gone to a Norwegian company instead. Mr Cox said KBR, the American owners of dockyard management firm DML, had recently assured him it was committed to a successful future for the yard. The loss of the contract comes at a crucial time for 180 workers who already face jobs cuts after the yard lost a £10m contract earlier this year. The yard has struggled to find new work since it was taken over by Devonport dockyard owner DML in 2004. Mr Cox said: "I am extremely concerned at KBR's evident want of commitment to supporting Appledore shipyard. "The shipyard is of such importance to the local community and economy in Torridge, and I am distressed that KBR has not matched its promises of support for the shipyard by assisting Appledore's bid for the survey vessel. "The news is a heavy blow to the entire workforce after their strenuous efforts to secure the vessel." He said he had asked Defence Secretary Des Browne for an urgent inquiry into the loss of the contract, following his department's concerns about KBR's float on the US stock exchange. "I also believe that this news raises further questions about KBR's support of DML as a whole," he said. KBR, a majority shareholder in DML, was unavailable for comment. KBR was floated on the US stock exchange this month by owners Halliburton, despite concerns from the Ministry of Defence (MoD). 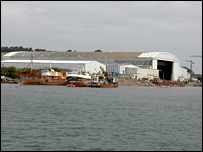 The MoD wanted the listing to be postponed, fearing that it could threaten Devonport dockyard which is operated by KBR.